• A geologist explains the formation of the "teepee buttes" of Pueblo and El Paso counties (Colorado). • I cannot think of any job more frustrating (assuming that one took it seriously) than to be director general of Afghanistan’s National Environmental Protection Agency. On the other hand, the news about Persian leopards is surprising. • Myths about carrying concealed weapons. There is one that I tend to be guilty of too. When you buy a camouflage camisole ($24.99) from the Ducks Unlimited catalog, a portion of the proceeds goes to conservation projects. If you visit Bozeman, Montana, and buy a pair of Schnee’s Pac boots, you will find a tag dangling from the laces, along with a promise that the Rocky Mountain Elk Foundation will receive some of your money for elk conservation projects. • You probably did not know that sometimes squirrels are carnivorous. Time-lapse video showing changes in the cap of an Amanita muscaria mushroom, found on Raven's Bread, the Amanita blog. 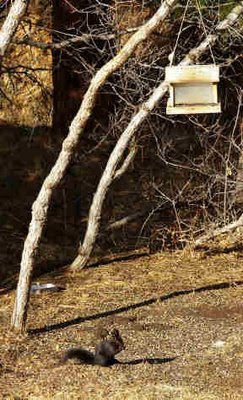 Note the Abert's squirrel. I planned to start deer hunting close to home this afternoon, but the weather was not cooperating. Before the season started, M. and I had hiked over the East Ridge and replaced the batteries in the camera that I had placed a few days earlier at a tiny seep that I call Camera Trap Spring (original, eh?). The first two-day placement had produced no images at all, but there is not much water in that little valley -- something had to show up at the spring. Today was cool and misty. Just when I was ready to head out for an evening sit at the spring, rain and thunder started. I decided to just hunt/hike over, fetch the camera, and come back. When I reached the spring, I saw that the camera's (rechargeable) batteries were dead. That could be good, I thought. 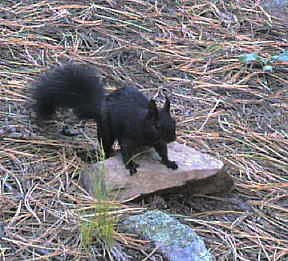 An Abert's squirrel. Multiply this image times eight or so. It was one active squirrel. 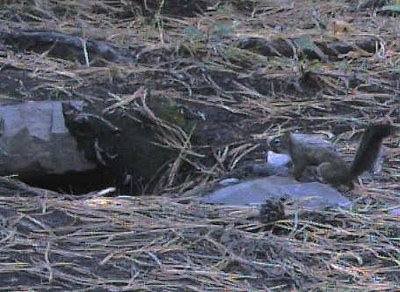 A pine squirrel had also been visiting the spring. There were multiple shots of it as well. 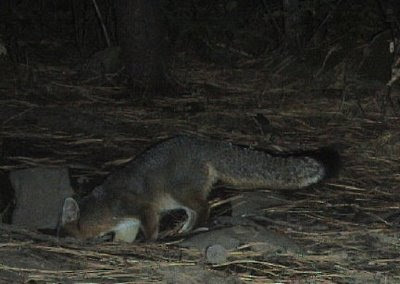 A gray fox showed up about 9 p.m. Thursday night. But whoa! Look who stopped by for a drink in the wee hours of Saturday morning. 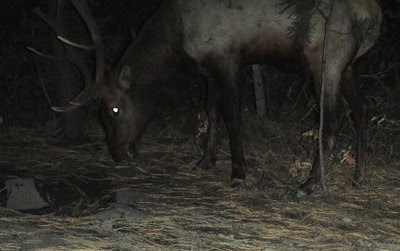 Was this thirsty bull elk the reason that the water level in the seep had dropped? Sneaky guy -- he is hanging around in this patch of deep forest all the time, I bet, and coming out to feed by moonlight. ¶ I thought that every rural deputy sheriff could recognize marijuana plants -- but evidently not in Mississippi. ¶ Squirrels: Are you with them or against them? If suburbanites painted murals on their walls like those on the Lascaux caves, you would see plenty of squirrels. ¶ I wonder how the sleepovers with sheep are going? The reader comments on this one are amusing. ¶ Ken Salazar will push the Brown's Canyon Wilderness Area bill. The Backcountry Hunters & Anglers have been active in support of it. 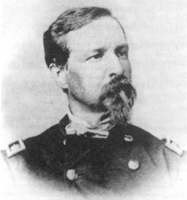 ¶ The People for the Ethical Treatment of Animals and the Humane Society of the United States spend most of their donations on further fund-raising. You were surprised?
. . . in the eternal duel of Dog and Squirrel.